Easy Hair Styling Tips from Professionals. Learn a few professional hair styling tips that can make all the difference in your hair routine. Check out these useful tips and make your hair look more luscious than ever! Hair stylists are constantly perfecting their styling techniques and help you achieve a great look without too much effort, so run through the following professional hair styling tips and embed them in your styling rut. Give your hair a boost of volume while the hair is still wet as this way the result will last longer. Use a blower and a round brush to dry the hair with precise movements starting from the roots and working the way down the hair shaft. Divide hair and take 2-inch sections at a time. Start with the nape of the neck towards the top layers. If you want more volume but don't have it naturally, switch your hair care products and opt for ones that are designed to boost volume. 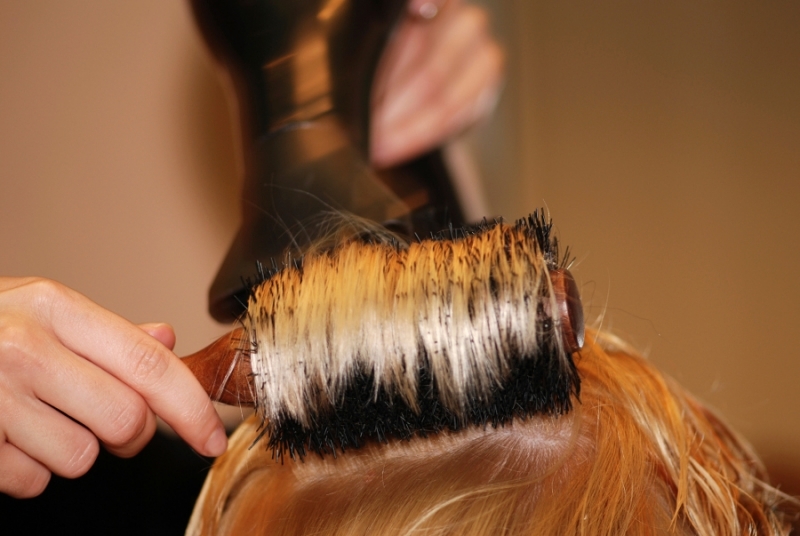 A few layers cut through your hair will also give your hair the volume it lacks. Keep static hair at bay by washing your hair with a moisturizing shampoo. To make sure your locks will look fabulous all throughout the day, spritz a little bit of hairspray onto your brush then brush your hair into place. To mend dry, split ends, apply a drop of silicone based serum using your fingers. A tiny drop will do as you want to keep your locks looking smooth and shiny, not heavy and greasy. Concentrate the serum on the dry parts of your hair and the ends, this way your locks will look shinier and will be protected from frizz as well. If you wish to give your locks a gorgeous curl without any heat, pop in a few hair rollers and hit the shower. The moisture will set the loose curls, leaving your locks looking fabulous once they're removed. To get the perfect result make sure your hair is completely dry before removing the rollers from your hair. To get a natural wave prep hair with a mix of leave-in conditioner and mousse. Apply only to mid ends and ends of the hair avoiding the scalp. Then use your fingers to move the hair from side to side scrunching with your fingers. Place the diffuser attachment on your blow dryer and place the hair strands onto the diffuser, then press it against the scalp (make sure the heat is on medium setting) so that the curls can get their shape set. To dry the roots flip your head over and blast them with the hot air, then gently come back up. Use your fingers to gently comb through hair and break curls once your hair is dry and get a nice, natural texture. Creating a perfect ponytail could be a little bit tricky, but with the right tips you'll manage to obtain a sleek and fab result. Before you start, make sure you have a hair elastic and three bobby pins. Hook two bobby pins on the hair elastic on opposite ends to get an elastic that works much better when trying to style a pony perfectly. Then spritz your hair with some salt water and brush the hair through while blow drying it in the direction you're going to style the ponytail. Brush the hair back and position your pony where you desire and slightly tilt your head back to make sure the hair at the nape of the neck doesn't remain looser. Once you have a tight grip of your hair, smooth out the hair once again and place one of the pins from attached to the hair elastic through the hair at the crown of the head. Wrap the elastic until firmly tight and pin the other bobby pin close to the scalp to secure the pony. Take a hair strand from the ponytail and wrap the strand around the hair elastic to conceal it. Pin the end of the strand with the third bobby pin and apply a bit of hairspray then smooth the hair with your hand to flatten any flyaway hairs.